I'll admit I'm one of those people who has been very critical and leery of Soledad O'Brien. I just never bought into her and her whole series on 'Black in America' did absolutely nothing to quell those doubts. But I most admit this exchange she had with the editor-in-chief with Breitbart.com made me look at her a little differently. I'm not completely sold on her, but I may be warming up a little bit. “Well, the bombshell is the revelation of the relationship between Obama and Derrick Bell,” Pollak pointed out. “Okay, so he’s a Harvard Law student and a Harvard Law Professor, yeah.” O’Brien added. 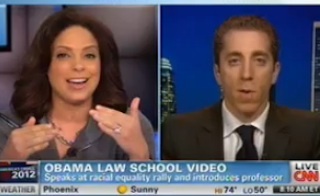 The two argued over the relevancy of critical race theory to the conversation, with O’Brien trying to move things back to the “bombshell” and Pollak saying, “You can’t derail this, Soledad.” O’Brien eventually concluded that Pollak wanted to make the connection between Obama and the “radical” Bell. Pollak accused O’Brien of obfuscating the real issue, which was the media sweeping things under the rug, and O’Brien began to accuse Pollak of still not understanding critical race theory. Then Panelist Jay Thomas interjected. He asked if Pollak was afraid that a secret black movement was going to rise up and murder him. Pollak responded by saying he was just accused of being a racist and afraid of black people, but answered Thomas’ query anyway. “At every point in his life when he could have followed the path of Martin Luther King, he threw in his lot with the Jeremiah Wrights and the Derrick Bells of the world,” Pollak said. GBTV’s Amy Holmes then chimed in, wondering why the raw video didn’t surface in 2008. Holmes countered by saying that it should have been something, “for the public to decide, not the media to decide,” and that the media, “did not allow this to be put into the public square.” She then made a stellar observation that she was a vegetarian in college and now enjoys prime rib. It’s not about digging something up on Obama, Holmes explained, it’s about the media not putting it out there. And for the record, Amy Holmes is wrong. The video was shown in it's entirety on PBS during the 2008 election. Now granted people don't watch PBS the way they should doesn't mean it wasn't shown. you're warming up to her? she looked like a complete idiot today. which interview were you watching? She is not correct about CRT. Professor Bell's own writings define it closer to how Pollak described it. Well I see the White Nationalist have landed on the Savvy Sista and still aren't bold enough to post their names.... I think it really hurts your poor little bigoted feelings that Black people can read and analyze... Having read several of Bell's books including his writings on Critical Race Theory, his conclusion what that the laws passed during the Civil Rights error were unnecessary and his reasoning for that is because the Constitution granted all citizens individual rights and liberties so why should Black people need special laws to give them what they were already supposed to have in the first place??? Do you know the white guy is married to a black woman? And so...what is your name? Afraid to post it because you are nothing but a bitter, bigoted, angry black chick?